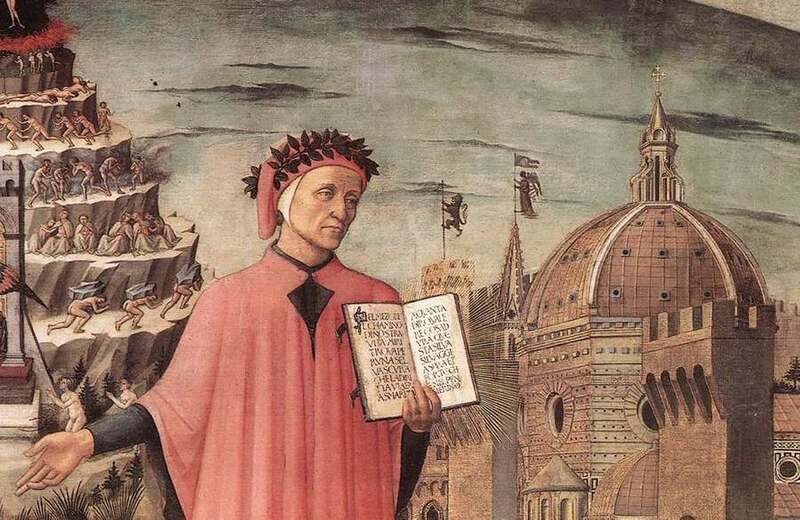 Dante, poised between the mountain of Purgatory and the city of Florence, displays the famous incipit Nel mezzo del cammin di nostra vita in a detail of Domenico di Michelino's painting, 1465. “The problem,” he went on, “is that the list of things that people on both sides of our ever-wider and ever-deeper partisan divide consider to be ‘just plain wrong’ grows longer with each passing day.” And as a result, “Each side considers the positions embraced by the other to be not just foolhardy or ill-advised but fundamentally unjust (‘just plain wrong’) and therefore beyond politics, beyond negotiation, beyond compromise or accommodation, and so also worthy of indignation and denunciation.” And indignation and denunciation are tightly connected with rage and wrath. It’s a terrifying state of affairs though hardly a new one. Wrath, once perhaps under control and aimed only at certain people, becomes an irrational passion, unworthy even of beasts. The wrathful assault anyone within reach. In Hell, there is nothing left of them but wrath and they choke on it as they choke on the mud in which they wallow. Increasingly, that image describes the atmosphere all around us. As Dorothy Sayers commented in “The Other Six Deadly Sins,” for the wrathful person, “His fury is without restraint and without magnanimity — and it is aimed, not at checking the offense, but at starting a pogrom against the offender. … His evil lust of wrath cannot be sated unless somebody is hounded down, beaten, and trampled on, and a savage war dance executed upon the body.” That was back in 1941. So there’s nothing new except that social media make it easier. There is, by contrast, an appropriate anger. It exhibits restraint and magnanimity and its aim is “checking the offense.” But that’s rare today. Instead the “evil lust of wrath” poisons marriages, families, friendships, churches, communities, and most obviously our politics. Are we just stuck or is there some cure for our “self-righteous rage”? Dante, having described how unrepentant wrath is punished in Hell, goes on to describe how the repentant are cured. Purgatorio, the second volume in his Divine Comedy, is about sanctification, overcoming sin and growing in holiness. The wrath in our political culture cannot possibly end well. We must learn to hate it — especially when it wells up in our hearts. “The effect of Wrath,” wrote Dorothy Sayers in her translation of Purgatorio, “is to blind judgment and to suffocate the natural feelings and responses, so that a man does not know what he is doing.” Thus those punished for wrath suffocate in the mud and those being cured of wrath suffocate in it as well. As Dante climbs Mount Purgatory to the terrace of the wrathful, “a thick smoke, black as night” surrounds him and voices in the smoke implore God’s mercy as they sing the Agnus Dei. There he sees images depicting those who chose meekness over wrath. Mary finds twelve-year-old Jesus in the Temple and, rather than exploding in anger, tenderly asks, “Oh, why have you treated us this way, my child?” (Luke 2:48). The Roman Valerius Maximus gently turns aside a call to seek vengeance. And St. Stephen forgives and prays for those stoning him to death (Acts 7:59-60). “Those things you saw,” his guide tells him, “were shown / That you might not refrain from opening / your heart unto the waters of that peace / brimming and spilling from the eternal spring.” (Purgatorio 15.129-132). Dante understood that the cure for sin always involves a push and a pull. The push is learning to hate the suffocating, soul-killing results of rage. Look at history: any movement founded on rage and wrath kills. It is the root of riots, lynchings, gulags, repression, and genocide. The wrath in our political culture cannot possibly end well. We must learn to hate it — especially when it wells up in our hearts. The pull is learning to love wrath’s opposite. Contemplate Mary’s tenderness rather than parental indignation, Valerius’ gentle answer rather than vengeance, and St. Stephen’s forgiveness rather than cursing. That’s not — at least not initially — a cure for our wrathful and raging culture, but as one of those undergoing the cure for wrath told Dante, “Thus if this present world has gone askew / look to yourselves, in yourselves lies the cause.” And in yourselves, by the grace of God, lies the cure — one angry sinner at a time.